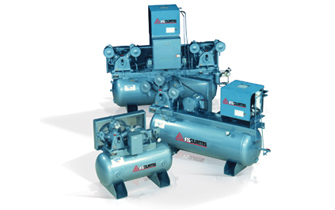 FS-Curtis Climate Control Compressors provide clean, dry air for instrument control equipment. Available in Simplex and Duplex models ranging from 1/3 to 25 HP. All units are factory set at 80 PSIG to deliver the cfm you require for you application. All Climate Control Compressor units with mounted dryers are shipped in wooden crates with heavy-duty skids. Duplex dryer mounted units are built for strength, accessibility and ease of handling. Duplex control panels available with 150 VA, 120V transformer. All performance data is ASME tunnel tested in accordance with industry standard practice. Oil carryover guaranteed within 6 PPM. Electrical motor guaranteed within +/- 5% of full load stamped nameplate amperage draw. Standard Equipment includes: Large intake filter silencer, ASME National Board Stamped receiver, ASME safety relief valve, pressure gauge, receiver condensate drain valve, discharge line check valve, discharge line check valve, receiver shut-off valve, v-belt drive, NEMA motors and pressure switches, OSHA totally enclosed steel belt guard, crankcase lubrication level indicator, and pressure switch operated automatic start and stop control (Set 80 PSI). Optional Accessories for the Simplex includes: Magnetic motor starters with overload protection and on/off switch, discharge air coalescer filters, low oil level shutdown, automatic condensate traps, air-cooled aftercoolers, refrigerated dryers, isolator pads, spring isolators, and PRV station. Optional Accessories for the Duplex includes: Magnetic motor starters with overload protection and on/off switch, discharge air coalescer filters, low oil level shutdown, automatic condensate traps, air-cooled aftercoolers, refrigerated dryers, isolator pads, spring isolators, PRV station, and alternator panels-provides equal utilization of compressors to minimize maintenance downtime.